Keyflow’s mantra and ethos is ‘through health, comes performance’. We take pride in our products and in the way they are made. We work with some of the most respected and trusted equine nutritionists in the world to formulate our feeds along with the most advanced technologies to create them. Along with this, the ingredients that we include in our feeds are carefully chosen because of the nutrients, specification and quality that they provide – if you take a look through Keyflow’s ingredients lists, you will note that the price of ingredients is not a driving factor for us. Most of all, we take pride in the health of the horses that we are involved with, it is this, in line with our ethos, which is our single biggest motivation. We include soya hulls in several of our products as we believe, and several published scientific papers will attest, that they are an excellent source of highly digestible fibre for horses. We don’t purport for this form of fibre to be a single source, but they are a useful, proven and nutritious ingredient we offer as part of a healthy, balanced and modern equine diet. Soya hulls are the husk, or skin of the soya bean – i.e. the outer shell that surrounds the bean. The beans are high in protein and oil whereas the nutritional profile of the hulls is quite different, being much higher in fibre (around 35-40%), which has been shown in numerous studies to be very digestible and they are also comparatively much lower in protein. Their extremely low starch and sugar content gives them a very good ‘profile’ as an ingredient in equine feeds for a variety of horses. Contrary to some, rather misinformed opinions, soya hulls do not undergo any form of chemical processing, they in fact barely undergo any ’processing’ at all. 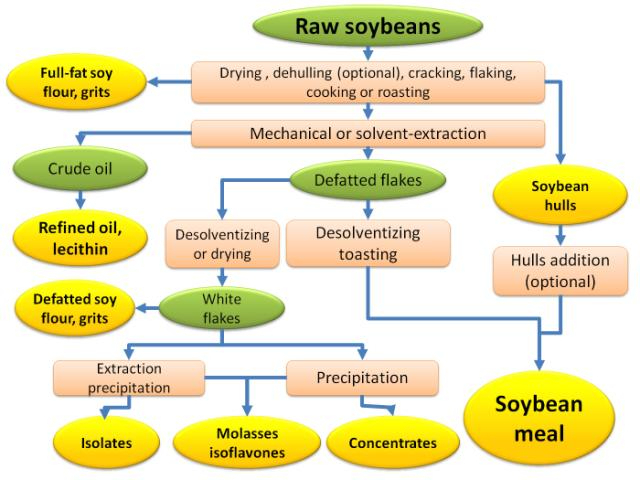 The first step in soya bean meal production is to mechanically remove the hulls, a fairly simple separation process. They are then ground and pressed into pellets for economical transportation, to companies like us. That’s as far as their ‘processing’ goes. The remaining bean then goes on to be made into various products, but the hull pellets are what we take and use in our feeds. By definition they are a ‘byproduct’ but for the purpose for which we use them in equine nutrition, they are the perfect ingredient. This is regardless of whether they are deemed a ‘byproduct’, a ‘primary product’ or anything in between – see the diagram below from feedipedia which shows that dehulling is the first step. Soya sourced from GM crops is a contentious issue globally with the most concerning and talked about aspect in horse health being the engineered resistance to glyphosate and pesticide sprays used during the crops life cycle. Concern has been raised about the potential for the residues of these sprays to remain in the plant material and then make their way into equine feeds, ultimately entering the digestive tract of horses causing damage and health defects as a result. This is a very concerning prospect, not least of all for us. Remember the primary reason we at Keyflow exist – to improve horse health, our mantra, our ethos. Currently, we are unable to guarantee 100% GM free status of our feeds due to some of the soya based ingredients. Soya bean based protein and soya hulls hold an ideal profile for the horse in terms of high quality protein and fibre specification, something which cannot be overlooked when working to formulate the very best, high-spec, powerful and healthy feed, even when weighed up against trying to source ingredients with hard IP, GM free status. Presently, for soya hulls this doesn’t exist, but we are working hard on it and all we can say is watch this space. In the meantime, to reassure you that our feeds are pure, clean and free from any form of pesticide and glyphosate residues we have instigated an ongoing testing program, which, to our knowledge, is an industry first – and we’ve started with Pink Mash. I am pleased to say that in our first run of tests that Pink Mash contains, not even a detectable trace, of over 200 different pesticide and glyphosate residues. In the interests of complete transparency, if you wish to see the latest report, please contact us and we will make it available to you. Your horses health will only ever be improved by feeding Keyflow and your peace of mind can be assured. As ever, if you would like more info on this topic or you have any queries, please contact us and we will be happy to hear from you.